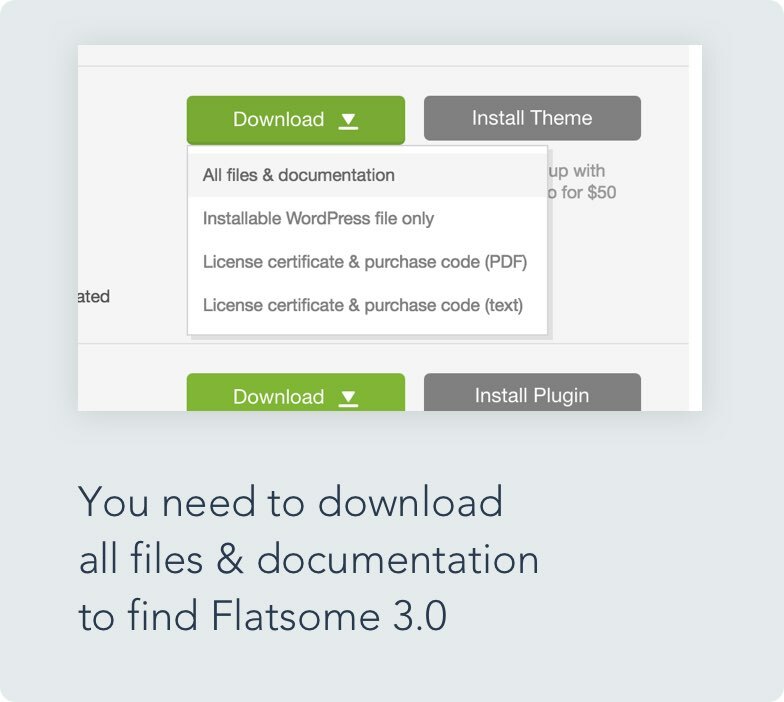 Flatsome 3.0 is completely rewritten from the ground up, so things will look a bit different than they do on your current site. This could give you problems if you have done heavy customizations with CSS or if you are overriding templates in a Child Theme. We have tried to keep the theme as backward compatible as possible. We’re really sorry if the upgrade gives you problems, but we really think you will love the new Flatsome. Flatsome 3.0 zip file can only be found inside the 'All files and documentation' zip file. Always take a backup of Theme Options and site when upgrading to a major new version! The Flatsome 3.0 file is located in the "Flatsome 3" folder inside the "Theme Files" folder you'll find inside the main flatsome.zip file. Unzip the flatsome3.0 zip file. Delete or rename the "flatsome" folder located in /wp-content/themes/ folder. Upload the new unzipped "flatsome" folder. It's important that you use the same name to keep old settings. Go to WP-Admin → Appearance → Themes → Add New and then click "Upload theme"
Upload the flatsome3.0 zip file located in Theme Files folder. It should be ok to continue using your old Child theme with Flatsome 3.0, but you need to remove or update any files that are overriding Flatsome template files.